A licensed practical nurse (LPN) who wants to advance his or her career can earn a bachelor’s degree in nursing (BSN) through a bridge program. 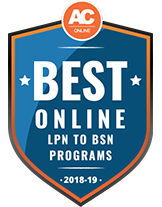 Online LPN-to-BSN programs allows students to pursue competitive job opportunities or specialize in a certain area, such as wound care, pediatrics, or gerontology. LPNs with full-time jobs or family responsibilities can complete coursework online and fulfill clinical training requirements at approved healthcare facilities near them. The following page explains online LPN-to-BSN programs, licensing requirements, and career opportunities for aspiring RNs. Online psychology degree programs provide students with the skills and knowledge needed to enter or advance a career in the field. Quality online psychology programs should be affordable and accredited while providing a platform for academic success. We have ranked the top online psychology degree programs based on our comprehensive methodology to help students find the nation’s best online psychology degrees. Find out who made the cut for our 2018-2019 list here. North Dakota State University is host to an online LPN-BSN option for students seeking licensure as a registered nurse. In order to qualify for this 2-year program, you must hold an associate degree in nursing with a minimum 3.0 grade average, a current LPN license, CPR certification and passing scores in advanced placement exams. Graduation entails the satisfaction of 122 credit hours exploring psychosocial nursing, leadership and health assessment. Online learners can utilize resources such as a writing center, tutoring services and academic advising specific to distance education. At Kent State University, licensed practical nurses are eligible to enroll in a hybrid bridge program to earn a bachelor's degree in nursing. Applicants for LPN-BSN studies must possess a 2.75 GPA in undergraduate work. Following the completion of 120 credit hours in classes such as Health Care of Children and Nursing of the Critically Ill, students are prepared to take the National Certification and Licensure Exam. Use of the Olga A. Mural Simulation Lab will provide practice experience for graduates as they enter into the role of a registered nurse. There are options to participate in a daytime, evening or weekend cohort. Indiana State University offers licensed vocational and practical nurses a fully online format for completing a bachelor's degree in nursing. Admissions criteria are based on grade average in nursing prerequisite coursework, Kaplan Admission Test (KAT) scores and the interview process. The LPN-BSN program requires maintenance of a 2.25 grade average while working through 120 credit hours. Students are also expected to fulfill clinical hours within their location of residency. The Career Center and the Student Nurses Association link enrollees to networking and professional development opportunities. Students licensed as practical nurses can work through a combination of on-campus and online studies to earn a bachelor's degree through Clarkson College's LPN to BSN program. Following the completion of 130 credit hours, you will be equipped to pass the state exam for becoming a registered nurse. Graduates enter into positions at hospitals, nursing homes and insurance companies. Transcripts, SAT or ACT scores, a personal essay and demonstration of proficiency in English will determine admissions eligibility. The Success Center connects learners to web and campus resources. At Presentation College, licensed practical nurses looking to earn their Bachelor of Science in Nursing may do so online through the school's LPN-to-BSN program. All courses are delivered online and asynchronously, meaning that students may access coursework at any time that's convenient for their schedules, rather than at scheduled times. This 121-credit program provides an accelerated path for LPNs to gain credit for professional experience to expedite their bachelor's degree program as well as prepare them to pass the National Council Licensure Examination for Registered Nurses. To be admitted to Presentation College, students must enter with high school GPAs of at least 2.0 and qualifying ACT or SAT scores. Additionally, the LPN-to-BSN program requires applicants to submit completed reference forms. Becoming a registered nurse after serving as an LPN (known as a licensed vocational nurse, or LVN, in California and Texas) can be an attractive option for those who wish to specialize in a certain area of nursing or advance in their careers. excelled in math and science courses; volunteered at a hospital, clinic, or other healthcare organization. completed an associate’s degree or certificate program to become an LPN. passed NCLEX-PN exam to obtain a state license. worked as an LPN at a doctor’s office, hospital, or other medical center and gained valuable work experience. found work as a registered nurse (RN) at a hospital, physician’s office, or other healthcare facility. The life of an LPN can be hectic and stressful, so there may not be much time available in the individual’s schedule to dedicate to in-classroom training. If an LPN/LVN aspires to be advance his or her career as a registered nurse, he or she can enroll in an online LPN-to-BSN program that allows the student to take nursing courses on their own time. Students enrolled in these programs can study at their own pace, participate in live discussions and forums online, and interact with classmates and instructors through an online platform. A bachelor’s degree program in nursing includes a clinical component. Even though LPN/LVs have plenty of training in the field, LPN-to-BSN bridge programs require students to work on certain projects and assignments in a lab setting and complete clinical rotations at a hospital or other medical facility. Students earning their nursing degree online will need to make time in their schedule to complete their clinical requirements, network with medical professionals, and learn about the role of a registered nurse offline. At this level, building connections by attending workshops or seminars related to nursing topics, and participating in group projects can help to round out a student’s educational experience. 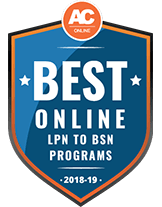 The online LPN-to-BSN programs offered by many accredited colleges and universities across the country can be completed in less than a year, in most cases. Students typically complete coursework in two semesters of full-time study and four semesters of part-time study. Graduates receive a BSN degree and can sit for the state examination to become a registered nurse. Unlike LPN/LVN training programs, the BSN program includes a broader range of subjects as well as introductory courses in certain specialty areas. Students who wish to further their career with a master’s degree or research studies can pursue an advanced degree after graduating from an online LPN-to-BSN program. BSN training teaches students how to provide nursing care to individuals and families, function as a part of an interdisciplinary healthcare team, and use the latest healthcare technologies and software programs to perform job duties. practical application of basic nursing skills, effective communication skills to address the needs of different types of patients, and implementing appropriate therapeutic interventions. a BSN nurse is qualified to deliver care in a variety of settings, including private homes, neighborhood clinics, military hospitals, general hospitals, physician’s clinics, and outpatient centers. in addition to treating patients, nurses will be well-equipped to share health care information and treatment options so that patients and community members can make the most informed decisions about their health. a BSN nurse learns how to lead a task force, train or develop LPN/LVNs for their role, or participate in committees and management groups to lead a department or organization. an RN is responsible for handling different types of cases, working with a team of doctors and other medical professionals, and preparing reports on a particular case for further review. Pharmacology in Nursing Focuses on providing safe patient-centered care when administering different types of drugs and evaluating clients receiving various medications. This is typically a lecture-based course that may be completed entirely online. Clinical Nursing Teaches advanced nursing skills through evidence-based methods and teaches students how to use the latest information management systems. This may involve a laboratory or clinical component with hands-on activities and projects. Nursing Research An introduction to the scientific inquiry as applied to the field of nursing, research methods, and tools used to conduct research effectively online and offline. This may be a lecture-based course with assignments that involve group or individual projects. Health Assessment Students learn how to review health history data, perform a physical assessment, and learn the basic components of a comprehensive health assessment performed at the patient intake stage or during treatment. Psychosocial Nursing An overview of psychosocial concepts and coping strategies when caring for different types of patients and those affected by mental health conditions. Topics may include appropriate communication skills and methodology and treatment modalities for different types of patients. The Accreditation Commission for Education in Nursing (ACEN) is responsible for specialized accreditation of nursing education programs at all levels, including certificates, diplomas, and professional degree programs. The Commission on Collegiate Nursing Education (CCNE) works autonomously and accredits baccalaureate, graduate, and residency programs in nursing across the country. The National League for Nursing Commission for Nursing Education Accreditation (CNEA) accredits LPN and LVN programs, diploma, associate, bachelor, master’s, and clinical doctorate degree programs in nursing. For more information about accreditation for online schools, visit our detailed guide to accreditation. Participating in workshops, seminars, and other events designed for nursing professionals throughout their educational career can help a student make professional contacts, learn more about the industry, and learn networking skills along the way. Having a valid nursing license and a bachelor’s degree in nursing qualifies individuals for a number of attractive job options in this growing field. According to the U.S. Department of Health and Human Services (HRSA), the number of trained RNs is expected to grow 33 percent from 2012 and 2025, and nurses make up the single largest healthcare profession in the United States. Many positions require additional certification and training. Works with students and faculty members to perform health assessments and screenings, provide basic nursing care for those who are ill or injured, and recommend a treatment plan. May be responsible for serving as a nursing coordinator to educate patients about their health. Works with elderly patients and individuals with disabilities in a nursing home or assisted living facility. May be responsible for performing health assessments, administering medication, managing patient feeding, and providing acute care. Also known as a clinical nurse specialist providing home care, this nurse is responsible for providing direct patient care in the patient’s home. They may be involved with assessing the patient’s health, treating illnesses, providing basic nursing care, and educating family members or care givers about the patient’s health. Works with patients with mental health problems and illnesses in a mental health care facility or similar organization. May be involved with prescribing medication, providing counseling services, and providing basic nursing care based on the patient’s unique needs. Works in ambulatory care or emergency services department to provide physician support and basic nursing care to patients in critical condition. Most are certified to work on emergency cases and must have sound judgment skills to work well under pressure. Completing an online LPN-to-BSN program prepares students to sit for the licensing exam for registered nurses (NCLEX-RN). All registered nurses must be licensed by their state’s Board of Nursing before they can practice. The National Council of State Boards of Nursing provides information about state boards across the country. For more information on licensing requirements for RNs, visit our detailed page about online RN programs. Completing a specialty certification program after completing an LPN-to-BSN degree can give an RN the chance to specialize in a certain area. Some positions, such as school nurses and emergency room nurses require additional certification. For more information on specialty certifications such as pediatric and home health nursing, visit our detailed page about online RN programs. Taking classes to become a certified nursing assistant (CNA) can put an aspiring nursing professional on the fast track to entering the workforce without a degree. These programs provide basic training and job-related skills to help students develop the practical and social skills needed to succeed in this field. Individuals who are satisfied with entry-level positions in the field can enjoy a career as a licensed practical nurse (LPN) or a licensed vocational nurse (LVN). These programs prepare students to sit of the NCLEX-PN exam and obtain their state license to practice. Coursework includes a combination of lectures online and clinical rotations. Those who wish to serve as a registered nurse (RN) can complete an online RN program that covers upper level courses beyond basic LPN certification and training requirements. Students can choose between shorter, certification and diploma programs or comprehensive bachelor’s degree and master’s degree programs online to become an RN. Coursework includes a combination of online lectures and discussions, and clinical rotations.